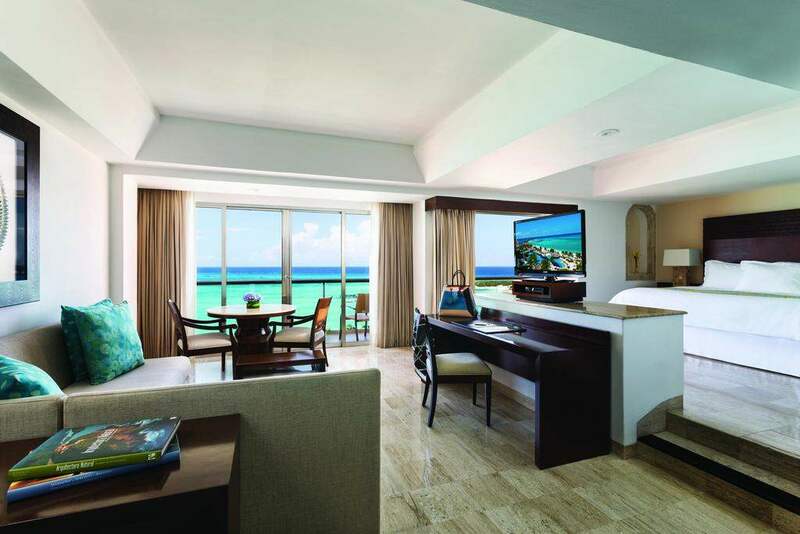 The suites at Grand Fiesta Americana Coral Beach Cancun include ocean front views or partial ocean views. Every suite features a private balcony and a seating area. For the guest’s convenience, a minibar and an in-room safe are also available. I travelled here a few years back with my mother and had a wonderful experience. This place is located ideally within walking distance to where the action/shopping is located. 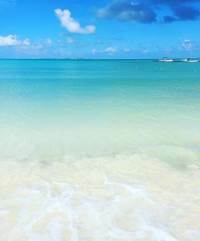 The beach and color of the ocean is beautiful here, one of my favorite places and actually took my breath away. 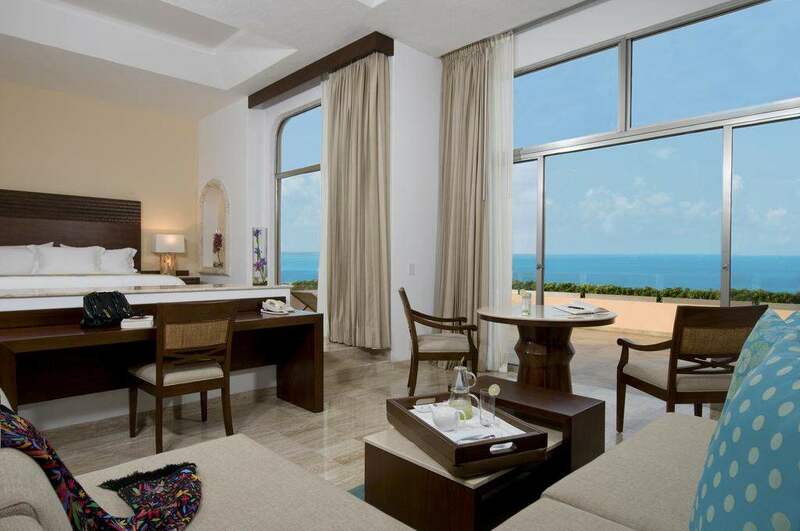 The standard rooms are decorated luxurious with light colored marble and have very nice/comfortable beds with a view. 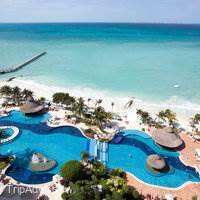 If you are looking for a non-all inclusive then this place is perfect. We visited the resort in June to celebrate my granddaughter's graduation from High School and my sister's birthday. The rooms (jr suite), were large with a beautiful view. The staff was very friendly and accomodating. 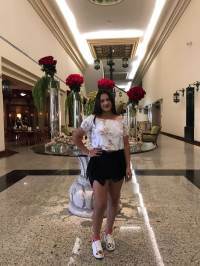 Loved the restaurants and food, especially the breakfast buffet, I would visit again..
My parents and I took a 5 night vacation to this resort, and we were so amazed at how amazing the staff was! They were so patient with everything, and always smiling and happy! It truly shows just how much their staff loves what they do! Our room was on the 8th floor with an INCREDIBLE ocean view! 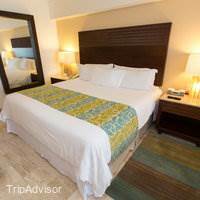 They were very very clean, and the cleaning staff were so sweet and helpful anytime we needed more water or coffee. You truly get what you pay for at this resort. It was my birthday on our last night there, and I was surprised with an amazing chocolate cake, balloons, and champagne for 3 sent to our room around 6:30 pm. I felt so special!!! We laid by the pool a few days because the rainy and windy weather at night sent a lot of sand towards the tide in the ocean, making the water look dirty. 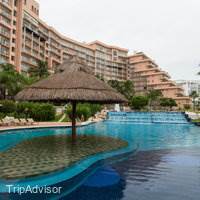 However, they have 3 giant pools with amazing staff delivering drinks, and every few hours, complimentary snacks such as brownies, popsicles, and fresh fruit. The beach/pool chairs are very comfortable, and we had plenty of clean towels daily. One of the ladies serving food and drinks on the beach had brought us fresh coffee, even though she didn't have any available. She ended up finding us fresh coffee anyways! So kind. The sand is amazing, it was like walking on clouds! They have a crew that cleans the sand and pool every morning, it really shows how much they love this place! We had dinner at La Joy for my birthday, and the crew was so amazing! They sang to me, and gave me a slice of heavenly cheesecake. We got to experience a show with dancing during our buffet. No complaints at all from us!! We felt like royalty here, and we cannot wait to book again this coming winter. 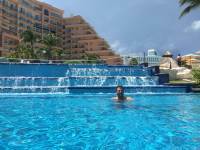 We just got back from our 7 night stay at grand fiesta Americana coral. I read many reviews before the trip and was hoping I wouldn't have a bad review. 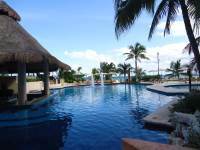 Of course each person has their own list of importances for vacations so here are the pros/cons- Pros Absolutely gorgeous views with many pools and 3 swim up bars. 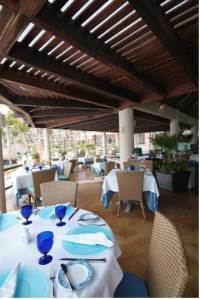 Food and service was great at the swim up bars and great prices as well. Air conditioning worked great in both of the rooms that we were in. Nice rooms with a gorgeous view. Gorgeous and calm beach. Perfect for swimming. The resort was pretty bare during the week but extremely busy on the weekend. We asked for pricing on the upgraded room. They moved us from the 3rd floor to the 11th for our honeymoon. We had to sign a waiver on food being brought in but we were still able to bring in snacks. We sat through the breakfast for the vacation club. It was def worth it. We received 25% off our remaining food and beverages for the remainder of our trip. Walking distance to shops and restaurants was great. Short distance to the mall. Spa was expensive but great! ConsWe paid for a king ocean front room and instead they tried to give us a room with 2 queen beds. We went to bed on our first night at 7:30pm. We had been up nonstop for the last 4 days for our wedding so we were exhausted. At 8:00pm our room door opened- light went on then off and the door shut. My husband and I popped up in bed at the same time so we know it wasn't in our mind. We called the front desk and they transferred us without saying anything then we received no answer. We got dressed, went downstairs only for them to tell us it was the housekeeping and just to keep the privacy sign on the door to keep it from happening again. The first room they gave us was loud. It was on the 3rd floor and you could hear chairs moving up above and doors shutting in the hallway. The beds were soooo uncomfortable (very firm). We bought sleeping meds just to be able to sleep. We contemplated sleeping on the couches. On the second to last day- they tried making us pay for another night and another day of resort fee. Finally they said ohhh we had already paid it. Pools close at 8pm. Pool food service is only open at 11:30 and closes at 6pm. I would recommend not going to the flea market. It was crazy with soooo many people trying to sell you things. No wifi on the 11th floor. Long long check in. We went for the buffet breakfast for $30 each but it wasn't worth it. We didn't know we could get an endless amount of bloody Mary's though. Had we- it might have been. All in all- we would not revisit the hotel. However, if our cons aren't your type of cons then I say go for it! We spent the better part of the afternoon and early evening in the hotel spa called Spa Gem. It's a 5-star spa. We discovered that their goal is to become the highest-rated spa in all of Latin America.I couldn't take too many pictures obviously. But we used all of their facilities, the aromatherapy steam room, invigorating shower, clay steam room, rain shower, sauna, ice room, polar pool, Jacuzzi, and finally the pebble walkway. The idea was to go from hot to cold to invigorate the skin and circulation. 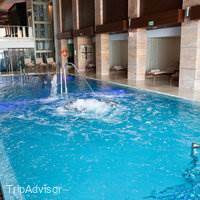 We were escorted through each of these rooms and pools with our own personal attendant. I was in the ladies' wing and Jose was in the men's. Then they brought us together in their large indoor Pool of Sensations, filled with geysers, water cascades, and cervical massaging jets. We then were escorted into a relaxation room where we were made comfortable on a very large size chaise lounge for two. We were offered pillows, tucked in with heated towels, and offered fresh fruit and tea. Complete luxurious service like I've never experienced before. If this was not stupendous enough, we then had a his-and-hers Swiss massage, which is what we came there to do. It was marvelous. I could swear my masseuse's hands were made of silk. Once they left the room, Jose muttered, "That was the best damn massage I've ever had," LOL.After the massages and an opportunity to freshen up, we were escorted to their dining room where we had a very romantic candlelight dinner in our robes. It was quite different but ultimately relaxing and sensual. A Great place with Great Value! 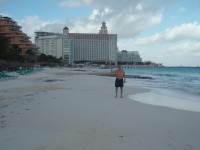 Compared to some other Resorts in Cancun I think this is the best one for the Buck! The Junior Suites are really Nice l laid. These are similar to the Venetian in Las Vegas BUT Nicer! 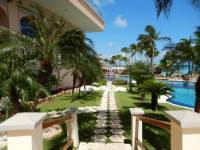 !All of them have Ocean front or Ocean View with Balconies! The Bath rooms are a nice size. Start with the only negative - as soon as we checked in we were kind of hounded for time share seminars. We literally just walked in, but the ladies were very pleasant, and could see that we just wanted to get to the room so she let us go. Other that that, the stay was perfect. We have a 5 year old, so we checked in and went straight to the pool, how relaxing! Luis by the pool is wonderful, always checking in with us and remembered our names the next day, and was our waiter the entire trip. The breakfast is phenomenal, Wilbur was our waiter most days and so pleasant. Anything you want to eat is there, and can eat inside or out. 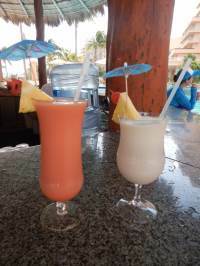 Swim up bars in all 4 pool areas, I highly recommend the margaritas....Dinner can be at La Jolla - Traditional Mexican with music; Isla Contoy - buffet every night and absolutely delicious! (Really)Issac was our waiter there and so great, gave us a special cheesecake on our last night. There is also La Basicilla which is adults only - didn't eat there but looks like fine French Dining; also a bistro for light fare. 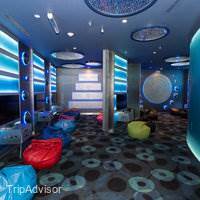 The Kids club is to die for if you're a kid, and you can do half or full days - they have their own water park with slides, video game room, cooking classes etc. The rooms all seem to have ocean views, we were in 812, considered oceanfront, but would have been happy with an ocean view as well. All rooms have balconies and amenities were clean and nice. Turndown service included at night. Gym is gorgeous, clean and modern. Water bottle and towel on every machine and cleaned all day with full ocean view while working out. Didn't get to the spa, but we plan on returning next year so will have a treatment next time for sure. The beach is perfectly located - almost like a private beach and since its almost north facing you don't get the rough surf like you do on the more southern strip hotels. Our 5 yr old could swim and not get pounded by waves like he did on our last trip. 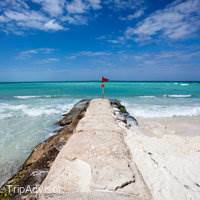 Also the ferry is right next door to Isla Mujares and Cozumel, but guys walk around the pools all day with water sport activities that you can do right from the resort - jet skis, boat trips etc. All in all, I highly recommend - have stayed in W hotels, Westin Resorts and high end places all over the world, and this is up there with them. Also planning to come with a group next time so the kids can all go to kids club together. Loved our stay there. 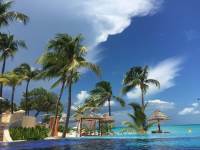 The best resort I have ever been too! This resort is absolutely amazing. The staff is super nice and very helpful. No matter what you request, Like extra towels, bath amenities, sandals, and other stuff. They try their absolute best to accommodate as much as they can. The resort has so many swimming pools and the rooms have the best view of the ocean and it's super big. The best experience in the resort is the SPA. When you come visit this resort, YOU MUST GO TO THE SPA. They provide excellent customer service and the messages are amazing. The Jet ski was a wonderful experience and you must try it out. The resort is also close to everything. 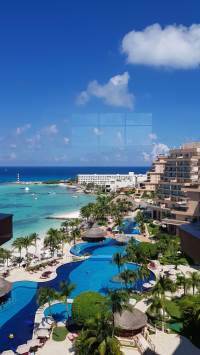 I highly recommend visiting this resort for your Cancun trip and I will definitely come back at this resort. 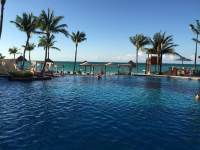 My wife and I and friends are staying at the Grand Fiesta Americana Coral Beach and it is the most amazing experience to stay here. We had to leave Cuba early because of hurricane Irma so we arrived at the hotel 2 days early and they were more than helpful. Now that we are here the service from the staff has been 6 star and to top it off I put in laundry this morning and 2 staff members come to inform me this evening that I had left $50us in my pocket and they were there to return it to me. I asked who can I give a tip to for being honest and they looked at me confused and said no sir we are just bringing your money back no tip required. I have been to many countries and stayed in countless hotels over the last 20 years for both business and pleasure and I have never felt as pampered and looked after as I have here. I have to commend all the staff, good job you are at the top of you game. We stayed at this hotel for five nights at beginning of September. My wife and I were really pleased with their service. We had an upgraded deluxe king room with an ocean view. I believe all their rooms have ocean views, the only difference is how close the room is to the ocean in terms of how they classify their rooms. The room service food was really good. I was shocked at how tasty room service was. Housekeeping came by twice a day, at night they would leave coaster looking things with chocolates. The staff in the lobby is really helpful. I had to interact with concierge a few times and they were really nice. They had umbrellas for guests to check out on rainy days ($60USD charge for lost umbrellas). The pool bar staff was helpful but at times I felt there were understaffed or tried to avoid those who swam up to the bar. The location was excellent. It was on the northern tip of the hotel zone. We were walking distance to all the clubs and evening festivities. We have stayed here 5 times, and no doubt we will be back. We have stayed at several other resorts, but you can't beat this place. First off, I have read some negative comments about the staff. I find it difficult to believe some of what I've read. From the doormen, restaurant staff, bar staff (Alfredo is our favorite), housekeeping, etc. Everyone is so polite and all you have to do is ask, and they will do everything possible to accommodate your request. We stayed in a master suite on the club level. The suite is huge with an incredible patio. By staying on the club level this also entitled us to food from 7am till 7pm at various locations and drinks from 7am till 9pm. 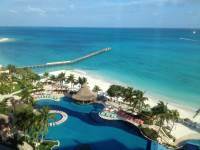 It also included 30 minute jet ski rental, 2 tickets to Isla Mujeres, a hydrotherapy treatment in the spa and transportation to the malls. A very good deal and I highly recommend it. First trip to Cancun after about 15 yrs! 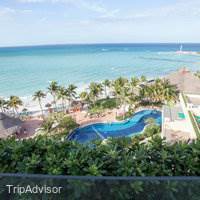 After researching many hotels I finally decided to book at Fiesta Americana coral beach and was happy I did. 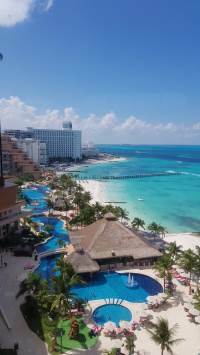 Upon arrival in cancun we had a terrible experience with the car rental company that coming to a hotel with such a welcoming staff was so relieving. You are immediately welcomed by the complimentary valet and welcome staff at the door. They take your luggage which is later taken to your room. Check in was pleasant they even offered us a glass of champagne and juice for the kids. After check in they hand you off to another person who tries to get you to agree to a presentation by offering you free breakfast (at 30 bucks a person I said why not) for 90 min of your time. I won't get into it but the breakfast buffet itself was pretty amazing had we enjoyed it ourselves, put we had an agent sit with us and it was kind of awkward. 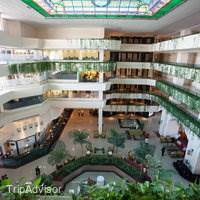 The hotel is beautiful, you immediately notice the pool and amazing beach views through the floor to ceiling glass windows. Room was big and roomy, very humid though, especially if your kids like going in and out to see the beach on the balcony. This makes the room humid therefore causing mold which was noticeable throughout the room. The spa was great, the pools were great , the beach was amazing. We saw workers raking the beach in the early hours of the morning making it clear off any seaweed. We had lunch one day at isla contoy which was awesome, it's outside under a big palapa and has great views of the beach. 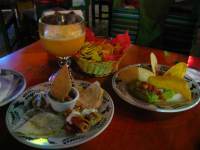 We had a dinner buffet at la joya which was delicious. They had so many options and everything was good. I especially liked that they had a separate room for kids after we were done eating , they went off to play games and we had a tequila tasting. We were sad to go but will definitely consider staying here again if we ever come back. I stayed here a year ago, loved it so much, I came back wth eight of my friends and family. 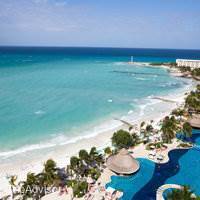 This is the best option for Cancun. The location is great. The pools are awesomeness! The hotel staff are the best and made sure to upgrade me to my same room type as before (master suite). Feels like a home away from home. Very important to have that private beach. This place just takes such good care of you its outstanding! 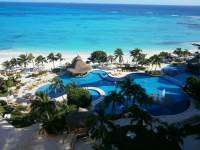 When in Mexico, I will definitely stay here again and again. Amazing stay all around ! Great stay all around !Even though our ocean view was in just a corner of our room we enjoyed lounging on the balcony and getting a grander view. Our room was very clean and seemed updated. Although we tried the on-site restaurants (which were all fantastic, in their own way ) and pool-side service it was also nice that we were able to walk down the street and have our choice of decent restaurants.Staff was very friendly and although we enjoy trying our Spanish the most staff spoke English. Crew on the beach were very helpful and always ready to bring a drink. So glad they had a Kids club ( with video games ! ) for our tween. Nice staff there too. On site tour manager for Chichen Itza were friendly and accommodating. It's worth the 3-4 hour bus ride to experience this Wonder of the World ! I rarely am effusive and reserve 5 stars for the very best, but for a resort that was not all inclusive this place has MUCH to offer ! 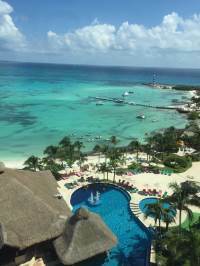 It was our second visit to Fiesta Americana in the past 3 years due the unforgettable experience we had on our first time.All the staff do absolutely everything to make your stay to be as most incredible as possible and they always get what you need with a big smile and cordiality.Rooms are astonishing and the view is incredible ! We made an amazing romantic photos session and I could hardly recommend to all lovers who want to have some fun plus an amazing register of the trip .I would like to thank especially Luis from the reception who did not measure any effort to change our room ,because we wanted one exactly like the same we had on the first time and this was a bit different on the balcony. In a few minutes he got the room as we wanted. Also, a big thanks to Nicasio, Roberto e Miguel from the pool bar. They made all difference on our stay too.Staying there is like been in a dream where you cannot believe . It's a perfect and complete experience and I am looking forward for the next stay. This is my second time at Fiesta Americana resort. 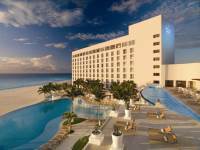 First post was for Fiesta Americana in Los Cabos. 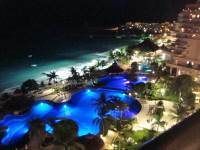 Because we had a great experience in Los Cabos, we chose Grand Fiesta Cancun Coral Beach. Service was superb; facility is immaculate; location is perfect with best swim-able beach and located in same block as the ferry dock; great amenities. ***The hotel is not an All Inclusive facility, so do your research don't blame the hotel later for it. Cons: The hotel needs a mild renovation. 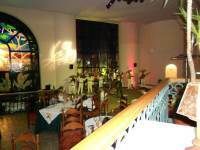 The designs of restaurants, especially Vina Del Mar are a bit outdated and some parts of the room can use a bit of help. However, the hotel is very well maintained and clean. However, this also shows that this hotel has maintained its popularity, elegance, class, and reputation throughout the years. Another minor con was the selection of restaurants for lunch hour. We had nowhere to go but Coral Cafe which has very limited selection of food, Vina Del Mar closed right after breakfast, and it was raining hard for us to access the poolside cafe. Again, if this place was an all inclusive and their selection was limited, I'd be upset. But, it's not so it was tolerable. Pros: Everything here was wonderful. 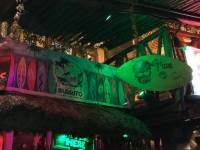 A special shoutout to Miguel by the Bikini Bar who was ALWAYS friendly, funny, and sincere. He is such a hard worker! Another shoutout to Tomas at Isla Contoy or Vina Del Mar. Isla Contoy provided dinner at Vina Del Mar due to bad weather on 8/21 so not sure which restaurant he actually works at. He was training the newbies but always attentive, accommodating, and kind. He ran all the way around the pool just to get me an ashtray because I wanted to smoke outside. I felt awful yet spoiled! Please tell them THANK YOU! People..stop complaining about the smell. It is the smell of humidity and air conditioning! The bugs come out when it is hot. It is the life of nature in the tropics. There is always someone in the hotel keeping busy to maintain the cleanliness and there is nothing they can do about the weather. Turn the air off, open the windows and control it yourself. 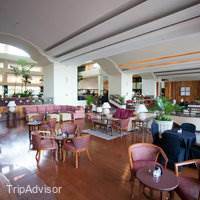 Advice to hotel: You provide variety of breakfast choices at the buffet and as a Japanese living in Los Angeles, having the option of Japanese food was something we appreciate and we saw other Japanese travelers going for the miso soup and rice. 2 days in a row, we noticed that rice was too mushy. If you can invest in a 8 or 10 cup Japanese rice cooker, it would help us and the hotel. Also, for the seaweed in the miso soup, keep it on the side and not in the soup because it expands when it stays in the soup. Other miso soup condiments would be tofu and green onions on the side. That would be plenty! No mushrooms needed. We will be back again. If not, will recommend the wonderfulness of this property. 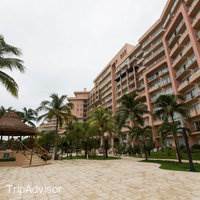 Unfortunately, my return to Grand Fiesta Americana after a year isn't how we once once experienced it. The first time we stayed was amazing. However, returning here in August 2017 proves otherwise. The staff is friendly & helpful but we are in Room 709 & isn't near spectacular. The balcony has a blocked view & an awkward setup. The living area faces the next room's balcony so you can't open your curtains without sacrificing privacy. And the room is smaller than we thought. The front desk didn't have upgrades available upon check-in, which is disappointing. 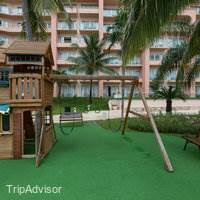 This was our second stay at the Grand Fiesta Americana Coral Beach. 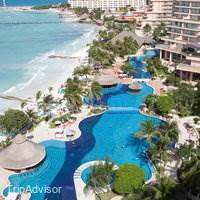 We have been to Cancun several times and stayed at 5 Star hotels. 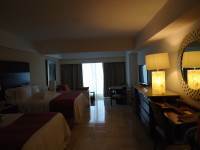 This hotel is the nicest property where we have stayed in Cancun. 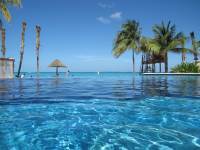 Their multiple pool and beach areas are the largest of the 5 Star hotels in the Hotel Zone. Everything about the place is first class and the service far exceeded our expectations once again. There is a huge number of employees working at this facility and every employee we met spoke excellent English. There are two pool bars and several themed restaurants including a 5 Diamond French restaurant and the food in all of them was outstanding. 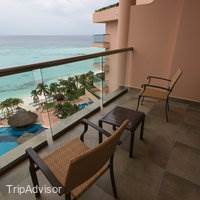 I think every room in the resort has an oceanfront view with a balcony. This resort is also family friendly. 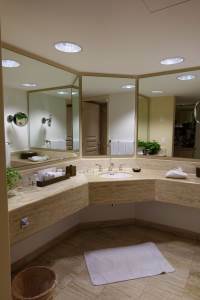 The common areas are very attractive and the entire facility was spotlessly clean. 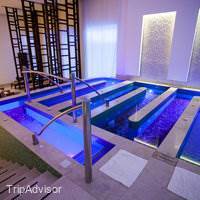 Their Gem Spa facility is huge and very luxurious with reasonable prices. 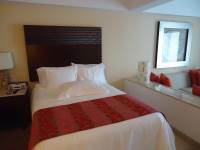 The hotel location is excellent very close to the major night clubs and shopping. 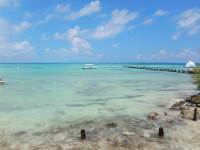 There is a ferry stop for Isla Mujeres literally at the edge of the property. We will definitely go here again. Had the best experience with Capitan Lorenzo and Rene who did a boat trip for us. Very pleasantly surprised by their amicability and service. Made us feel very special. 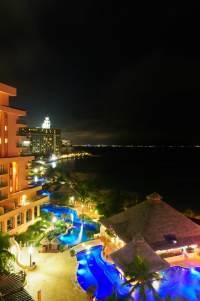 We were very disappointed with the Cancun experience but, captain Lorenzo totally redeemed cancun. Ask for him, you wont regret it. We stayed at this hotel in August 2017 for 1 week. We booked through Costco travel. We were upgraded to a master suite with ocean view and wow what an amazing room with an amazing terrace. Overall the hotel needs a renovation; finishes are coming off the mirrors, hardware, etc. Some of the walls are stained. 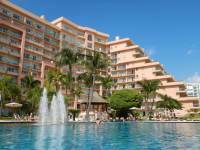 It's all very minor and so if you don't mind that sort of thing, this is a 5 star property at a great value.The pool area is very nice with one large pool separated by levels. In the kiddie area, there is a tiny play set. The bathrooms are also by the kiddie area but down a flight of stairs. The intrapool drinking and eating was a bit gross as some hotel guests spilled.The beach was a bit disappointing. We had stayed at the old Camino Real next door many years ago (which is now the Hyatt Ziva) and the beaches were nicer there. 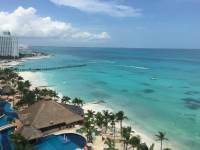 The beach is surrounded by the UltraMar ships that go back and forth from Isla Mujeres and a Sea-Doo rental area. The Sea-Doo exhaust made for unpleasant air; however it's very convenient for hotel guests to rent Sea-Doo's as well as snorkely tours. The sand was white and powdery but the ocean was not crystal clear. This could've been just due to the surf. We lucked out as we our trip was flanked by storms and none occurred during. The Lifeguard Ricardo was so helpful. My 7 year olds skin was not reacting well to all the sun, sand, and chlorine. He supplied so zinc balm to help with the pain.We did a snorkel tour with Captain Lorenzo and Rene. They were so considerate and took great care of us. My 7 year who can't swim but who can snorkel was personally taken around the ocean via doughnut by Rene. They made sure we swam with the current to end up at the boat. They found us turtles. They gave us a little lesson on how to properly put on our snorkel gear. We highly recommend them.We had massages at the Gem Spa. They were fabulous. Also the spa sells some little knick knacks at a reasonable price.We ate at every restaurant multiple times. They need more restaurants in this hotel. Breakfast was great at Vina del Mar. We never ate buffet as it's just too much food but did a la carte (huevos rancheros, waffles, pancakes, french toast). 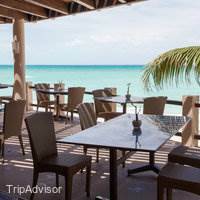 We had lunch at Isla Contoy-the staff was so helpful and the food was very good (hamburgers, shrimp, ceviche...). The dinner buffet at Isla Contoy is a bit disappointing in that there was only one main seafood dish.We had dinner at La Joya; the food there was not as yummy as the other restaurants but the beef tampiqueno was very good. 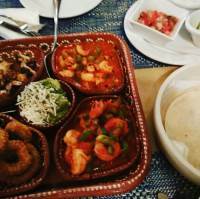 The mariachi and trio live music was awesome.My 7 year old ate free off the kids menu but the menu became quite stagnant after 7 days!There is a gift shop tucked in the corner of the hotel that sold some silver jewelry, drinks, snacks, knick knacks. There is also a business center where we were able to use the computer and printer to print out boarding passes. We also encountered a medical conference where they had a group of ladies selling locally WELL MADE Mexican style clothing. They were so kind and helpful and their products were of good quality.Overall, a great trip at a great price. This is a very reasonably priced hotel with very nice and polite staff. 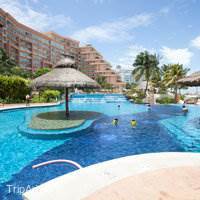 The hotel and staff at the Gran Fiesta Americana are totally centered on providing a superior customer experience. Every detail, every interaction, every day was great. Very impressed with the attention to details. I would highly recommend this property to anyone. Sunset Bar - bar next to the pool - great service and delicious food. Makes the day in the pool much more enjoyable. Rolando, Emilio and Isui are absolutely incredible. All speak good English, very friendly and in addition to a great service, they were our companions as well. Great experience for myself, my wife and our teenage daughter. Rolando, Emilio - those Buffalo wings were the best in a very long time - thank you friends! We had a great time here. Its a great 5-star hotel, great views and a wonderful spa. (Spa is a little pricey though). Excellent views of the ocean and all the restaurants were top quality. What we liked more than anything however was the friendliness and professionalism of the staff. The waiters, the reception staff, the people helping out at pool and especially the people working at the Kids Club were all very helpful. I would easily return to this hotel. 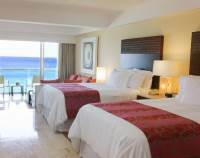 This hotel is exceptional for both families and active couples looking for contemporary luxury and also a lively, energetic atmosphere in Punta Cancun. Of course the restaurants are outstanding and the hotels immaculately clean and spacious and service impeccable, but the exceptionally noticeable features are the spectacular spa (make sure you at least try the hydrotherapy treatment), the French Mediterranean fine dining gem Le Basilic, and the most over the top luxury kids club I have ever seen in my life. Fabulous place for families and active couples. Just returned from an outstanding 4 night stay with my 2 kids at the GFA-CB. Best thing about this hotel are the pools, which are immaculate & beautiful. 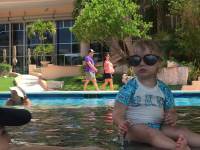 My kids loved the swim up bar where Vicente was friendly and attentive to their requests. The beach was clean & offers jet skis, kayaking, & paddleboarding. We didn't use the kids' club. 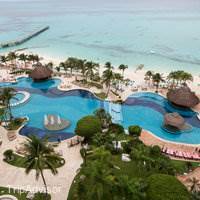 This is not an all inclusive resort but this did not detract from our experience at all. The food was of excellent quality & price. One kid's meal is free when an adult orders from the menu. If the kids order from the main menu, it's 50% off. There is a strict policy about not bringing outside food which is reinforced at check in. I wasn't approached about a time share meeting. The rooms were clean, spacious, & comfortable. We had an oceanview room with a balcony. Watching the ocean was so relaxing. The housekeeping staff provide service twice daily. The resort fee includes bottled water, internet (slow but functional), & water sports. Areas for improvement: check in was extremely slow. Sometimes I was given 2 simultaneous checks at the bar which was confusing; 1 was for the free kids meals. If I hadn't asked for clarification, I would've paid inadvertently for the free meals. Some reviewers mentioned the need for a renovation. Probably true but not a dealbreaker. They should give a list of services included; when we went to use the jet skis, we found out we were supposed to receive a coupon at check in. This Hotel was absolutely amazing and my family will definitely be staying here again. They took great care of us and all the services were great!! My family thoroughly enjoyed the stay here. 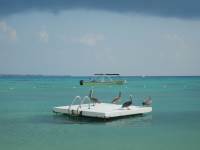 It is in a great location and right next to the ferry dock if you'd like to take a trip to Isla mujeres for a day. I've been coming here for 10 years, and it is still just as good. Every detail is covered. Rooms are spacious, with a sitting area and beautiful balcony views. Very clean. 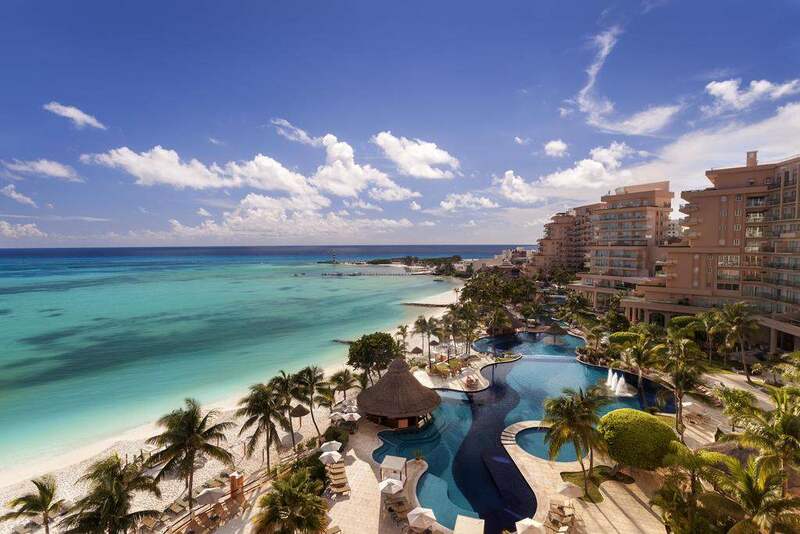 The best beach in Cancun. White sand and it's raked every morning so it is pristine. Priceless! Great hotel in a perfect spot. Stayed here for our 2nd anniversary. The hotel staff was friendly enough and the hotel itself was clean and kept up for the most part. The second night we were there they brought us a bottle of champagne and a slice of tres leches cake for our anniversary. While it was a cheap bottle of champagne it was a nice gesture all the same. I did notice the more pretentious you are the more attention you will get. We are not a pretentious couple, and while they never offered us a glass of champagne when we checked in (like they did a handful of other loud pretentious guests during their checkin), or go out of their way to ask if we needed anything if we were in the lobby (as I have seen them do for other guests), the staff still smiled and offered a greeting to us. Which is fine by me. 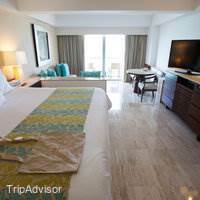 The cleaning staff is constantly polishing/cleaning something (handrails, doors/handles, floors), the pool bar and pool staff is amazing too-very courteous and while attentive they are not so in your face that you can't have a private conversation. The hotel is on a hill, so if you plan on walking to the local shops which are within walking distance (a block or so away), you will need to be careful going down the walk way as it is a little steep. So people in anything but rubber soled tennis shoes-you have been warned. 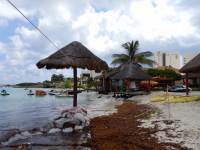 The ferry to Isla Mujeres is just next to this hotel. A block south and you are at the heart of the casual dining, clubbing, some small casual shopping, and the flea market another block south. 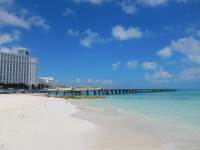 If you head west another block pass the Isla Mujeres, you'll find more casual dining, a grocery store, a shopping plaza, Starbucks, Mexico outlet, currency exchange store, and other little shops. Granted the only thing you're really not close to the the public beach, but this hotel has it's own private beach. 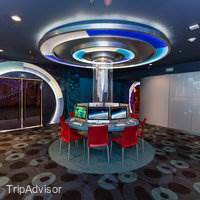 there are a few other fine dining that are farther away down the hotel zone strip, but this hotel has two fine dining restaurants in it if you want to try them out. They require reservations. We did not have time to try them as we were gone most of the day on tours and had to settle for some casual and very casual food from other places. 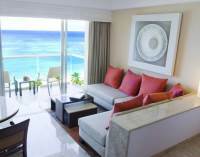 When we return to Cancun, I wouldn't mind staying here again. Since it's on the north end of the hotel zone strip, you aren't the closest to kid friendly activities. Granted the pool area is not deep (about 3 to 3.5 ft) so it's not so intimidating for children. But as far as family centered activities goes (aside from shopping) it's limited in this area, so for that reason I may stay somewhere else when we bring our daughter next time. (Yes, we could get a cab to go all the way down to the family centered parks, but traffic gets pretty congested at that corner of the hotel zone and if you've ever had to deal with a tired, hungry and fussy baby/toddler you would hate to be stuck in traffic too). 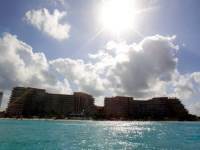 Superb Resort in a great location if you want pristine beach and calm water, also short stroll to many Bars & Restaurants. As it's huge it never feels busy and we always found two loungers on the beach .Breaky great value at $33 ( inc Bubbly )Would thoroughly recommend as staff were so friendly, helpful and attentive . If it weren't for the noise I would have given the review five stars. Aside from thicker walls the resort has everything you need. The pool was beautiful, large and well designed (although the temperature was a bit too warm and they should consider cooling it somewhat) and not over crowded. 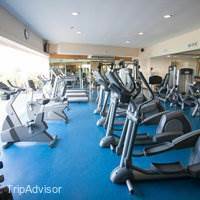 The gym was large compared to others I've come across in various hotels and had a variety of exercise machines to cater to most people. It also had a great view of the pool and beach. Who wouldn't want to work out here?! Gem Spa and the hydrotherapthy centre was just amazing (this gets six stars) and the resort also has a number of restaurants as well as a pool bar and lobby bar. All up it was a great stay, aside from the noise. I could hear everything my neighbors were up to including their alarm clock which set off at 7:30am on a Saturday morning. I also had to bang on the separating door and tell them to be quiet when they decided to come in to their room at 1am one night and make a racket - their kids were shouting and screaming and I couldn't sleep at all. The walls were so thin we had a conversation between us through the wall. Shame about the thin walls as I would consider staying here again if it weren't for the noise. After all one does go on vacation for a bit of rest and relaxation! Best resort pools on the planet!!! Forget about the awesome gym, restaurants, staff, room balconies overlooking the beautiful ocean and magnificent hotel lobby. 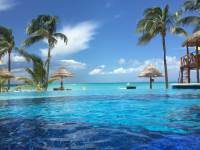 Check out these sweet pools and cabana bars in them!! I sat by one pool for two hours around sun set looking towards the endless pool which overlooks one of the most beautiful beaches out there. This is a first class hotel. You won't be disappointed. Last week we stayed at this hotel for 7 nights. It was truly amazing. I spent LOTS of time reading reviews on hotels and kept coming back to this one. I was looking for a beach that didn't have large waves since I have kids 7 & 5. This beach was perfect! Not busy, we never had trouble finding chairs at the beach. The pools are very spread out so it never makes it feel crowded. Chairs are a little harder to come by at the pool because people leave their towels on the chairs and don't come back. We were always able to find some but it would she take a bit of time looking. All of the staff were very friendly and helpful. The hotel was extremely clean! We ate at the hotel the whole time we were there and the food was much better than expected. We ate at La Joya the most. Every time we were there Jesus waited on us and he was exceptional! He was very friendly, our glasses were never empty and he made great recommendations. They had live music there every night and they even had a room for our kids to go in to play games and watch movies. The restaurant outside had wonderful views but the staff was much less friendly there and we would have to wait a while on drinks. Our kids went to the kids club a couple of times and really enjoyed it. We didn't know what to think about leaving them there at first but after a couple of days at the hotel we saw how well the place was ran that we felt comfortable doing it. My kids said they had more fun on this vacation than Disneyland! Our room was on the 4th floor and it was very nice. The balcony was one of my favorite places. We really loved staying at this hotel and would definitely stay there again. If I had to sum the whole experience up in one word it would be AAAAAAMAZING! 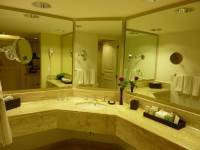 The rooms are large and upgraded bathroom & shower. Plenty to do on the Resort but if for some reason you want to go off campus, everything is close by! The staff is wonderful and the food is good too. The thing that made this so amazing for me was their Spa!!! It is the largest Spa in Mexico I believe. I spent 3 hours alone in the Hurd's Therapy Spa alone. Well worth the money and simply delightful experience! Can't wait to go back!!! 20th yr anniversary was amazingly perfect & memorable beyond words! The 5 Diamond Resort is centrally located to most everything within walking distance & close to transportation! 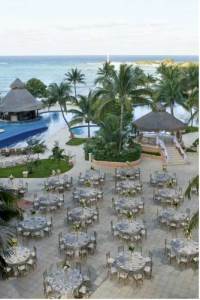 The resort is immaculately clean & cared for everyday, all day long. 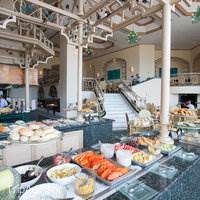 They have exquisite restaurants within the resort & the daily brunch has a wide variety to satisfy all cravings! Warm welcoming staff tops it all! A very exclusive spa will melt away all your worries & detox you beyond belief! A highly recommended resort to everyone who deserves an A-list red carpet experience!!! Thank you Grand Fiesta Americana Coral Beach Cancún.. we will be back!!! 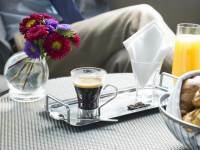 Outstanding hotel geared to accommodate guests in a plush of luxury, service and attention.. The service and attention are second to none. My family and I have visited the hotel on six different occasions and we love it. Can't wait to book our next trip. Good choice to travel with children! Good choice to travel with children! We went for vacation 2 moms and 3 children and had a great time. The hotel is very big and you can see is ideal for conventions and meetings but with the magical touch of including the whole family. The great. The captain and hostessOf the restaurant for dinner and one bell boy called Elias, he was such a great person during our stay. The good: pools for children, different sizes for kids and a good kids club with water activities ( this is part of what they include in the resort fee) Some people from the staff were so nice but we had to keep asking for basic services. The room was big enough and the beds very comfortable and the guys from Room Service were very nice. The not that good: you need to keep asking for the menu for different meal choices. We realised a bit late that kids can eat free from the kids menu and were pushed to eat buffets every time and we didn't want it.The UGLY. The internet we never could get the WiFi in the room and and a few times in the lobby and pool areas. Internet was HORRIBLE. Something we did not like was the fact of people from the hotel telling us that UBER was ilegal, which we don't know how true it was. But the taxis services were quite expensive and we had a few of very rude taxi drivers. We had a very nice stay and the location is really good! Even if you don't have the beach waves like other hotels is a great place to spend the family vacations! The Trip Advisor reviews described an excellent property and it's what made me select this hotel. 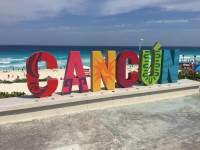 I've been to Cancun 20+ years ago when it wasn't so commercialized and touristy and didn't imagine returning knowing what it has become. I usually travel to more isolated areas and not the tourist resorts but we needed to be in a more accesible hotel due to friend's temporary disability. The hotel and its staff are just as everyone described, EXCELLENT! The breakfast buffet is incredible and reasonably priced for all the choices available. There is something for everyone, literally. 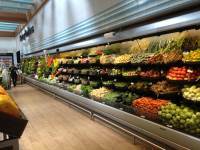 A juice bar where all natural juices with a wide selection of choices prepared to order. An area with eggs prepared to order and all sorts of Mexican dishes. Asian choices as well. A bread stand with all varieties of breads and pastries. A waffle, french toast and pancake area etc. 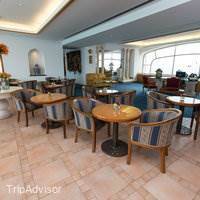 You will not be disappointed but what makes the breakfast even more special is the willingness of the staff and waitstaff to make sure you're having the best experience. We were waited on by Miguel several times - he is the nicest man with a great disposition and incredibly fast. The same applies to the wait staff on the beach and pool area, Alex and Jose Luis were as friendly as could be. 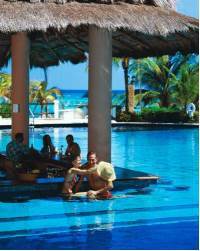 The pool and beach concierge staff is also on top of their jobs, running to set up parasols and lay out your towels. Joaquin on the beach helped us one day setting up a parasol and placing our towels on the beach chairs in a manner that prevented them from slipping off. As for our room. 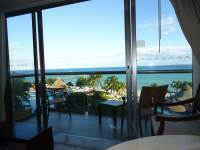 We were given a front facing Jr. Suite with a gorgeous view of the Caribbean on the 10th floor (room 1019). The room was impeccable. We had room service two nights and while the food is average, the way the staff sets everything up in the room, with complete attention to the small details made it special not to mention how inexpensive it was. Hotel room service is usually way overpriced. Here it's a steal and cheaper than eating out. In summing up, what makes this hotel a perfect place to vacation is the disposition of the staff and the meticulousness of the management. 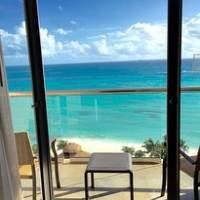 I would certainly return here if I decide to vacation in Cancun again, in fact I would return to Cancun because of this hotel hands down. 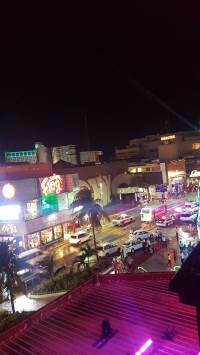 I'm not a fan of how Americanized Cancun has become and we didn't venture out but we didn't need to since all our needs were satisfied within the hotel grounds. 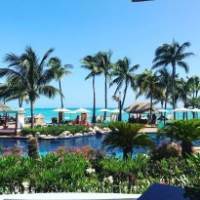 I heard this is the longest running 5 star hotel in Mexico - it certainly had that feeling. It was a great stay but felt a little dated - perhaps the last renovation occurred 10 years ago? It wasn't bad, but could use a few more contemporary/modern fixtures and touches. We were in the GE Club level - all inclusive - which was fantastic! The room was nice and spacious and had a luxurious, beachy feeling. We had a fabulous view of the ocean from our room and as a matter of fact, all rooms at the hotel have ocean views due to the position and layout of the hotel. 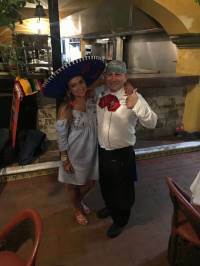 We enjoyed the food & beverage outlets - the breakfast buffet at Vina Del Mar was great, and also the dinner at La Joya was delicious and festive! We really enjoyed our time spent at the spa and the swim up bars. There is a place to rent wave runners close to the hotel which was a blast. 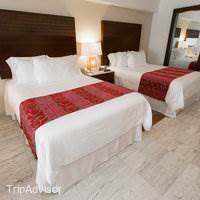 The hotel is located in the convenient Hotel Zone in Cancun which was easy to walk to different shops and some restaurants, but honestly with the all inclusive package at Grand Fiesta, we were pleased and quite content to stay on property. 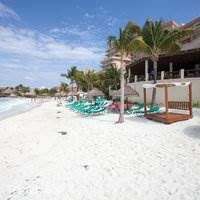 This very lovely hotel is set on a soft, sandy beach and located in the middle of the busy area of bars and nightclubs (if that is your thing - not mine!). 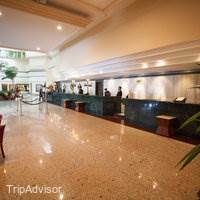 The hotel is very grand and luxurious, service is excellent and we felt very pampered. We just stayed a couple of nights before setting off on our travels, and although we were rather sorry to end our stay in this elegant hotel, it wasn't really our sort of place! 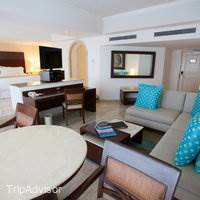 Just returned from my 6 night stay at Grand Fiesta Americana Coral Beach .I was there with my husband and my two boys (14 & 11 yrs) .We had a fascinating time there .We experienced unbelievable standard of service from every staff member we encountered.Starting from the check in representative to the in room service guy,everyone was extremely accommodating and always ready to go above and beyond to make our stay special .We ate at all of their restaurants during our stay and one thing that completely blew my mind was how they accommodated my special dietary needs .I have celiac disease and am extremely restricted when eating out.The moment I mentioned that to them ,they introduced me to the chef in each one of those occasion and the chef walked me through the whole buffet explaining what is safe for me to eat .This to me made a huge difference knowing what I can eat and how I can stay safe and healthy during my vacation.I sincerely want to thank them for going this extra mile for me :) The pool area was great .Both of my boys loved spending time there .It was very clean and well maintained .Their private beach is beautiful and very nicely maintained by the staff.We will definitely go back to Grand Fiesta Americana soon . 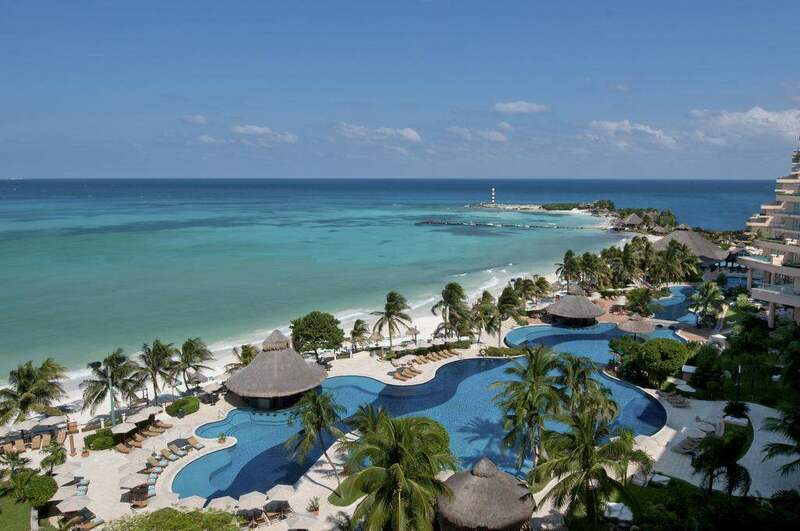 Lovely stay at this beautiful hotel with a beautiful beach, pool area, and amazing spa! The food was good and the service outstanding. Lots of opportunities for water sports as well. Highly recommend for families and couples alike! 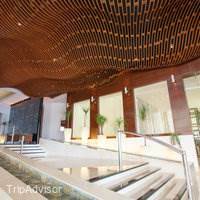 The Great: We loved everything about this hotel. We did have a room on the 11th floor and got very lucky so our view was beautiful. EVERY single person that works at this hotel was very nice and accommodating to your every need. The beach is awesome and the sand is almost like powder. They have employees screen the sand everyday and keep everything very clean. We would sit on our patio every night and watch the pool guy be very meticulous about cleaning all four pools which are all massive by the way. He would start at 8:00 and sometimes still be cleaning the pools at 7:00 in the morning. We were never bothered in any way from any of the staff and they helped immediately with anything we needed. The kind of bad: The only complaint I have is that the food is massively over priced for the quality. I read on past reviews that the breakfast buffet was not that great for $18.00 each but decided to go anyway. The breakfast was fine but when I got the bill it was $60.00 for two people and the "server" that did nothing but bring me a coke was very clear that this is the bill WITHOUT the tip. "if you want to tip, put it here" and then he just stands there. So I paid $70.00 for breakfast. I also ordered a Pina colada and a cheeseburger from the pool and it was $26.00. The good news is that it is a two minute walk to any kind of food you can think of. We ate breakfast at Vips for $17.00 right across the street 5 of the days we were there. You can order a three egg omelet from room service and that isn't to bad, we paid $24.00 for two of those twice. Overall this hotel was awesome and we had a great time. 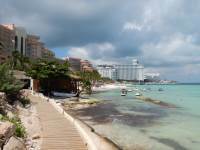 The ferry to Isla Mujeres is at the pier 50' from the beach which was very cool also. 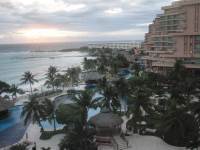 I have been to Cancun 5 times and this is by a massive margin the best hotel I have stayed at. 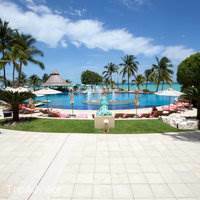 The hotel is located on a white sand beach with pretty swimming pools. The staff is friendly and attentive. The food is good - although we only ate at the casual restaurant by the beach. My son and I had a great time. Just came back from our 3-night stay and definitely enjoyed our time at the hotel. I like how they make a point to keep it clean everywhere. House keeping once in the morning, and evening they come back to check if you need anything. Restrooms in common areas seem to have regular staff attending. I was shocked to see the restroom by the pool has a lady clean after you instantly, therefore even though guests are wet coming in, restroom stays spotless. 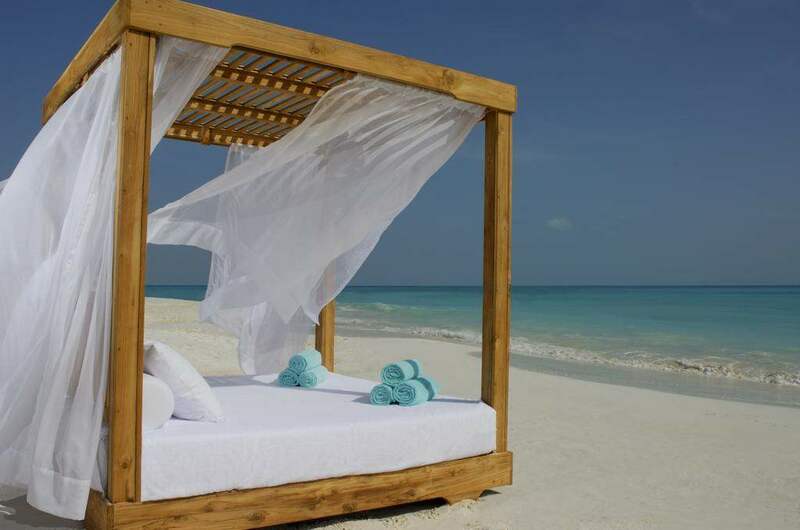 Private beach with soft white sand, and open shower for you to rinse. Towel and slipper services by the building entrance, even fresh water to rinse your feet. I'm quite impressed with these small things they have to offer. Tried the cafe, pool side bar & restaurant, breakfast buffet and room service. Other than room service all other foods are delicious. Kids menu are free as long as adults order something. We've even had breakfast buffet given us 2 for 1 for kids. The staffs are always very accommodating and friendly. 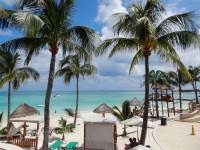 Great location, in the center of shops and restaurants, also next to the pier to ferries to Isla Mujeres. Overall quiet atmosphere. Some cons for not five star: Check in process was very slow, my husband stayed in line for 30 min, only to find out that our rooms were not ready until almost 6:30 pm, although they compensated with free meal and late checkout. Ac could be a bit stronger, especially in the lobby area consider how humid it is. Some things to note: no parents are allowed in kids club. My kids were disappointed with this but that's a personal thing. Make sure you read what's included in the resort fee, all bottled waters in your room are included, non motorized water activities are too for example. Pool closes at 9, which can be annoying but I can see that's how they keep it quiet. 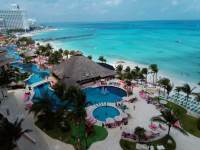 The Fiesta Americana Grand Hotel Coral Beach is the best hotel in all of Cancun. I would recommend it's beach and beach services for jet ski, para sailing, snorkeling and diving as the premier hotel anywhere.